What is the best way to state the challenge scientists face in their quest to find new and smarter means to fight bacteria? The weapons they have are failing as antibiotic resistance continues to develop. In its 2014 report on the state of antimicrobial medicine, the World Health Organization stated that we may be entering a post-antibiotic era in which "common infections and minor injuries can kill." Why is it so difficult to design antibacterials? Drug development, in general, is an extremely challenging field. Every drug must reach its target within the body. That means traveling through the bloodstream and entering cells to find the cellular system that it should affect. There are proteins in the bloodstream that can bind chemicals, effectively reducing the amount of drug that will reach the target. There are physical barriers that the chemicals must cross. There are even ways in which chemicals can be moved back out of the target area, as cells have ways of flushing them out. An ideal drug would not bind to any of the proteins in the bloodstream, would only enter the desired cell type and would only affect the target biological process. When the drug's purpose is to fight microbial organisms, it must also overcome a number of extra defenses. And herein lies the root of the antibiotic resistance that is reducing the effectiveness of our arsenal against these invaders. Antibiotic resistance develops when some of the bacteria possess mutations that allow them to survive the antibacterial attack. If a bacterium survives, it has the opportunity to reproduce and thus may pass on the mutation that let it survive. This is the start of a drug-resistant strain of the pathogen. Target-specific resistance has emerged against every class of antibiotics. Society needs new antibacterials that will travel well in the body, be potent against a range of bacteria and even have more than one target within bacteria, all the while having minimal effect on the host body. Striking a balance between all of these demands is essential. Chemistry is the science at the heart of the quest to find new antibacterials. Rigorous and exacting, this discipline underlies so much of the research that goes into improving our lives: the search for smarter and more sustainable energy sources, the development of safe new medicines, the control of outbreaks and the improvement of food and water supplies. Chemists worldwide are involved in antibacterial discovery programs, driven by creativity, passion and a pioneering mindset. Their goal to find newer, smarter compounds requires ingenuity, experimentation and tenacity. It also requires information. They must tap into the vast wealth of experimental data from all the programs that have gone before them even as they contribute to that pool of knowledge themselves. The challenges that chemists face are complex and the stakes are high. The response has been to find ways to optimize research processes. To borrow a phrase from the business world, scientists have focused on working smarter, not harder. Smarter research means quickly finding relevant data that allow researchers to work faster and focus their resources optimally. It means collaborating with the right researchers and information service providers around the world. With such data and partners, chemists can more easily build on what has gone before, predict the best paths for success and avoid the dead ends that can cost so much time and money. In essence, smarter research is about connecting ideas and people to drive research farther. Smarter approaches to the chemistry behind antibacterial discovery and development are already in place. As difficult as the task may seem, scientists around the world are already collaborating on putting the data together to gain the insight needed to find antibacterial agents that will prevent us finding ourselves in WHO's predicted post-antibiotic era. Think about the last time you took an antibiotic. If it was oral, the pills were probably large and you were asked to take them two or more times a day over the course of several days. This type of extended, high-dose regimen is essential to achieve the therapeutic goal of killing an evasive foreign cell inside of a host made up of drug-susceptible cells. Maintaining high drug levels in the host over an extended period of time to reach and wipe out the culprit bacterial population is the medical equivalent of "shock and awe" warfare. Achieving the desired outcome is not a trivial task. Pelting bacteria with insufficient treatment dose or for an insufficient period increases the likelihood that an oddball bacterium with a mutation that makes it resistant to the antibiotic survives the chemical storm and lives to produce other bacteria with the same mutation. Voila! You have a drug-resistant strain of the pathogen. The development of the antibiotic is also not a trivial matter. An antibiotic encounters a number of hurdles on the path from the point of administration to its target. All the tricks to overcome these obstacles must be incorporated into the chemical structure and formulation of the antibiotic. Generally, the antibiotic compound must travel from the site of administration to the site of infection via the blood stream or tissue fluid. Blood and its derivatives are to a large extent water, so the compound travels best if it is water-soluble. Blood also contains a repertoire of proteins, such as albumin and globulins, that have the ability to bind chemicals. This means that the chances of the antibiotic compound reaching the site of infection and being available to act on bacterial cells are significantly reduced if it does not dissolve well in water and if it tends to bind to proteins. A brute force solution to these bioavailability issues is to increase the drug dose – the more compound that enters the host, the more that is freely available. However, the host consists of cells that may also be susceptible to the compound, so the higher the dose, the greater the chance of adverse effects. Once the compound arrives at the site of infection, it must reach its molecular target within the bacterium. Unlike the cells of the host, bacteria have a cell wall that poses a formidable barrier. Gram-positive bacteria have a cell wall consisting of a thick, extensively cross-linked peptidoglycan layer that surrounds the inner cell membrane and is porous to small substances. The underlying plasma membrane can be penetrated via passive diffusion of lipophilic molecules. Unfortunately, lipophilic molecules are not very water-soluble, which brings us back to the hurdle of bioavailability. Additionally, membrane-embedded proteins called efflux pumps are known to thwart antibiotics by removing them from the cell. Gram-negative bacteria are even trickier. Their thin peptidoglycan layer is surrounded by a second outer membrane that works as an effective barrier between the environment and the periplasm, the space between the outer and inner cell membranes. The outer membrane is dotted with porins that regulate the traffic of molecules into and out of the periplasm and can act to exclude many antibiotics. Compared to Gram-positive bacteria, Gram-negative bacteria also have a much higher number and diversity of membrane-embedded efflux pumps. Finally, Gram-negative bacteria produce a greater variety of enzymes that metabolize antibiotics, such as several ß-lactamases, that render penicillins, cephalosporins, monobactams and carbapenems inactive. Since the type of proteins regulating molecular traffic is species-specific and the antibiotic must cross two chemically distinct cellular membranes, few antibiotics work against Gram-negative bacteria. One antibiotic class that is effective against Gram-negative bacteria, the fluoroquinolones, passes through the porins of the outer membrane as a charged, water-soluble molecule and then becomes uncharged and hydrophobic in the periplasm, which allows it to diffuse across the inner membrane. This environment-triggered change in molecular charge illustrates the complexity of developing effective broad-spectrum antibiotics. The final hurdle is hitting the target. Antibiotics work by binding to essential molecular machinery of bacteria and preventing these targets from doing their job. Some antibiotics punch holes in the cell wall of bacteria by inhibiting the enzymes that make peptidoglycans. 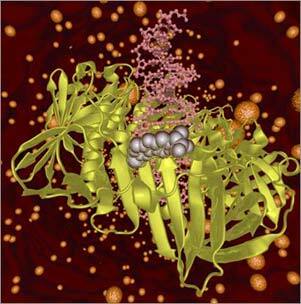 Others inhibit enzymes to prevent bacteria from synthesizing proteins or DNA. New antibiotic targets are needed to circumvent target-specific resistance, which has emerged against every antibiotic class. These new targets can be bacterial enyzmes or pathways that have never been exploited before, or novel sites of action on currently exploited targets. Curbing resistance development will require a very careful selection that invokes not only new mechanisms of action but also enables the development of multi-target monotherapeutic drugs: single compounds that simultaneously impact the function of two or more targets. In this way, if resistance develops along one line of fire, activity at the other target maintains the efficacy of the antibiotic. 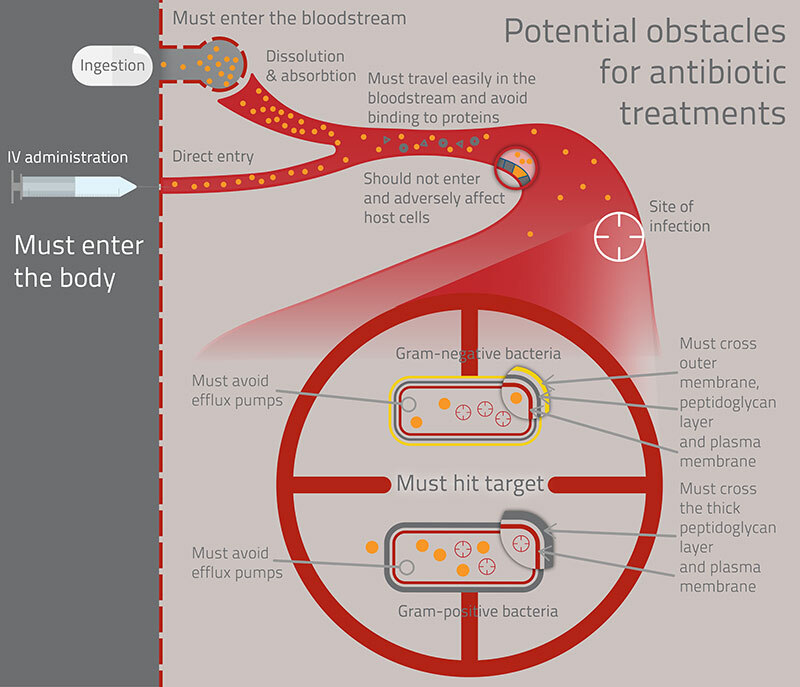 To sum up, in these times of high rates of antibiotic resistance development, an effective new antibacterial will need to be potent against a range of bacteria, especially the difficult Gram-negative species, hit more than one essential bacterial target, avoid hitting essential host targets, and exhibit effective bioavailability through good solubility and low binding to plasma proteins. Optimizing any one of these factors — antibacterial potency, solubility, or protein binding — often means sacrificing strength in another. Finding the balance or "sweet spot" that maximizes the amount of potent antibacterial agent that reaches and impacts its target will be the maker or breaker of future antibiotic development programs. This excerpt is from Dr. David Evans' article Sweet Spot of a Killer, which examines five antibiotic discovery programs, shedding light on the difficulties of designing these challenging drugs. Read the entire article on Elsevier's R&D Solutions website. 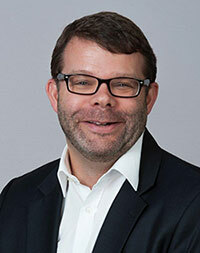 Dr. David Evans, Scientific Affairs Director for Reed Elsevier Properties SA, has led Reaxys Inspiring Chemistry efforts since the program's inception in 2009. He has been with Reed Elsevier (Elsevier's parent company) in a variety of roles for over 15 years, including journals and books publishing and software product management. He is also board member and the current Chairman of the InChI Trust, a charitable organization founded to support the development of the InChI – the international chemical identifier. David has a BSc and PhD in Chemistry from the University of Bath in the UK. Reed Elsevier Properties SA is a company within Reed Elsevier dedicated to the management, development and protection of intellectual property. They own a range of databases, publications and trademarks, including The Lancet®, Reaxys®, PharmaPendium®, Embase® and World Travel Market®, which are used under license.